Dropped my phone 3 feet on to a tile floor and a small chunk of the screen came out. 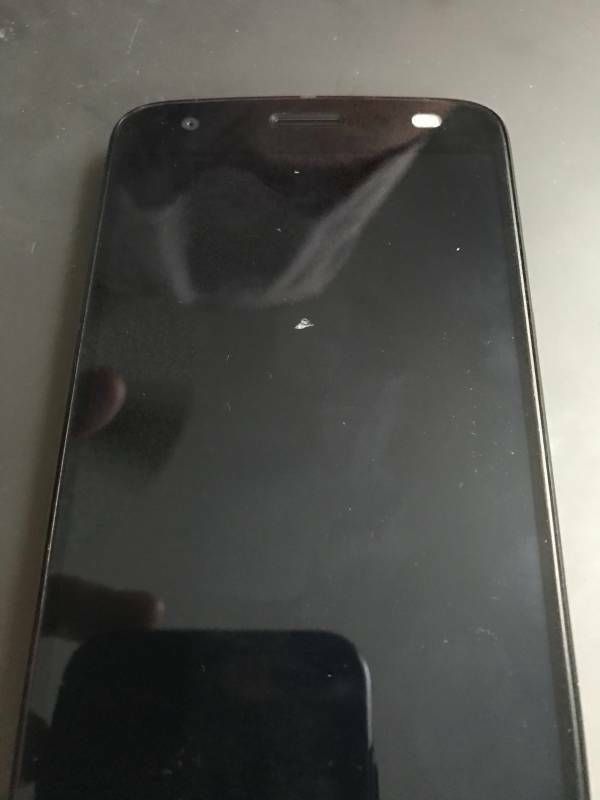 I contacted moto and they will replace my device luckily. I had a glass screen protector on order too bad they didn't have them in stock. Oh no! So glad that Motorola is going to replace it for you, and that everything is working out! At least now you have a screen protector en route to protect your next phone! I tried to get AT&T to do the warranty since its part of the manufacturer warranty but they said no. Hopefully it's back by the end of the week. Shipped phone back on Monday it's scheduled to be returned to me on Thursday a brand new device. So glad it will be returned to you on Thursday! Keep us posted! +1 for the Verizon flexible glass protector, fits perfect, covers everything, feels great. I had bought some shield IQ glass protector from Amazon which are junk. Go with the Verizon flexible one even though expensive at $25. stacy.stephen and NJ1193 like this. I bought a 2 pack of screen protectors off eBay for $7.99. They have the black around the edge to match the phone and the install very easily. Bought a Body Guards from AT&T and it broke while in my pocket and had lots of scratches after only 2 days. New phone arrived brand new added glass screen protector works great nice to know it has a 4 year screen warranty. protector is a must with any Shattershield phone. I use a screen protector on almost every device saves on deductible when insurance claim is used. Wow my bodyguardz seems to hold up good and I am in construction and my device gets banked around all day I would get a warranty replacement from them its got a lifetime warranty. Definitely slap a tempered glass protector on this thing. Still upsetting Lenovorola hasn't put factory tempered glass on the top layer of their 5 part super unbreakable horse-proof helicopter-proof screen. Need to Google Flagship. I'm guessing they thought it would be easier to have a screen protector in stores vs making one and expecting people to order replacements through them. I've dropped my phone and few times and am perfectly find with the trade off so I do not worry about a broken screen. The screen protector on my new device has worked well so far moto should sell the protector with every new device. Aftermarket tempered glass protector is life. Moto actually sells the outermost layer of the shatter-proof screen as a replacement, not that the layer is in any way a "screen protector" lol. I actually peeled it off my Z Force 1 before I sent it back. I just got mine Friday, and I already have a few deeper scratches,. How can a " unbreakable " screen scratch so easily? Because "unbreakable" has a different definition than "un-scratchable"
These Moto phones with Shattershield are notoriously easy to scratch. It is one of the main reasons I prefer glass rather than plastic as a screen. So what happens if that shattershield were to be peeled off and used with the glass under it? Is it a gorilla glass? No. Basically instead of Gorilla Glass, moto used shatter shield which is a plastic based screen. It trades scratchability for being shatterproof because it's plastic. I guess Moto figured most people will be putting screen protectors on anyway, lets make it shatterproof instead of scratch resist. I actually wouldn't mind this at all. That's a great and innovative move from Moto. I'd take that screen and then slap a tempered glass screen protector on it. The problem I'm finding is that plastic isn't as smooth as glass so putting a tempered glass protector into the screen results in areas it doesn't completely come in contact with so you run into bubbles or it not fully adhering. Plastic protectors work better on this screen because they are malleable unlike glass. Morty2264 and VZWsucks like this. You do have a point - it's hard to get a tempered glass screen protector to "behave" like its plastic counterparts. Why any Clock widget/app get stopped in my Redmi Note 4? My phone data is automatically getting on.what is the solution?